As the last phase of negotiations resumes on 20 November, the Algeria-led talks between the Malian government and the armed groups in the north should not be rushed as they offer a unique opportunity for a sustainable peace agreement. As northern Mali experiences renewed violence, with influential radical groups absent from the negotiations trying to spoil the process, the Malian government and participating armed groups have struggled to find common ground. 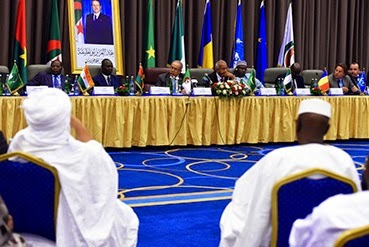 In its latest briefing, Mali: Last Chance in Algiers, the International Crisis Group builds on its January 2014 report, draws lessons from past mistakes and provides parameters for achieving a sustainable peace agreement. Actors involved in the negotiations must learn from the failures of previous agreements, notably the lack of funds to ensure quick implementation; weak international guarantee mechanisms that did not fulfil their early warning role; and the excessive focus on relations between the state and the northern regions that neglected the local balance of power in the north. The international mediation team – Algeria, the UN Mission in Mali (MINUSMA), the African Union, the Economic Community of West African States, the Organisation of Islamic Cooperation, the European Union, Mauritania, Niger and Chad – must provide guarantees to ensure funding and implementation of the agreement, and establish a mechanism to manage donor funds with the relevant local authorities. The longer public administration remains absent from the north, the more difficult it will be to fully restore the state’s presence. Any peace agreement must provide the different communities in the north fair access to political representation and public services, as well as participation in the security apparatus. The peace process must also be accompanied by popular consultations and provide for formal endorsement by the Malian parliament and/or the regions concerned. Algeria and France must overcome their so far ambiguous relationship of partnership and rivalry, and unify their efforts around a solid peace agreement. Once the negotiations are completed, the mediation team should serve as a contact group responsible for implementation of the agreement. “It is important to maintain the current momentum rather than hastening an agreement with minimalist security guarantees”, says Jean-Hervé Jezequel, West Africa Senior Analyst. “Signing a peace agreement is not the end game but a milestone in the process of building lasting peace”. “The resurgence of violence in the north and the difficulties encountered by the Malian political elites to undertake profound reforms make the success of the Algiers peace process all the more necessary”, says Rinaldo Depagne, West Africa Project Director. “This should lead to the signing of a peace agreement that is both realistic and ambitious”.